This resource is the product of qualitative research and presents ideas and materials which have been developed with children with speech, language and communication needs. The four full-colour A4 encapsulated illustrations are specially designed to support children in discussions regarding their everyday communication. The accompanying manual presents the evidence base and sets out a clear and accessible methodology for using the illustrations in discussions with children aged 5-10 years. Rosalind Merrick has over 10 years' experience as a children's speech and language therapist. Her PhD from the University of the West of England was awarded in 2009. ...The importance of listening to a child's unique perspective has become an important consideration in both therapeuetic and educational assessments with the responsibility of the adult to communicate with the child and understand what they have to say. 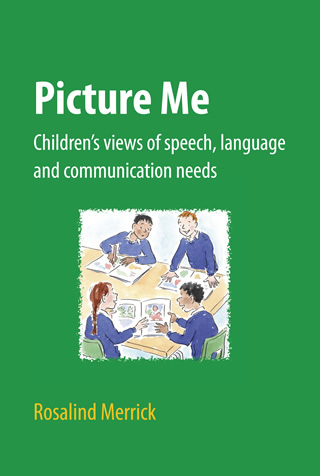 Picture Me: Children's Views of Speech, Language and Communication Needs provides practical ideas for children with speech language and communication needs (SCLN) to discuss their views and find out what is important to them. The four full--colour A4 encapsulated illustrations (classroom, playground, assembly and home) are specially designed to support children in discussions regarding their everyday communication. The accompanying 140-page manual presents the evidence base and sets out a clear and accessible methodology for using the illustrations in discussions with children aged 5-10 years. Although primarily written for speech and language therapists this book is equally relevant to specialist speech and language teachers and educational psychologists in providing an EPB framework to develop a dialogue with children rather than simply obtaining information from them. It will help practitioners to explore their questioning techniques and insight into a child's perspectives of their own speech, language and communication needs, which in turn informs their planning and promotes effective conversations with children. Talk is at the heart of children's experience of life, play and education. Listening to the child is the best way of gaining an insight into the world in which they communicate. If a child has difficulty in articulating their thoughts and feelings then it falls upon the practitioner, therapist or teacher to develop a rapport with the child and the professional skills to support them in their everyday communication. A small book, but invaluable as it provides practical ideas and a framework for both therapists and teachers to develop an open mind in asking children what they feel about their experiences and wishes regarding communication and assistance. Rosalind Merrick has over 10 years' experience as a children's speech and language therapist and this resource is the product of her qualitative research. Read the review from the NAPLIC Newsletter Autumn 2014 here.